In 2001 Shirley Okino started Meowscape.com. Her interest in origami and a love for cats was the inspiration for Meowscape. It seemed like a natural mix. 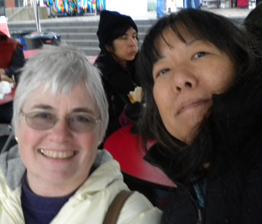 I met Shirley in 2007 while both of us worked as newspaper graphic designers on the Oregon coast. It was here that we struck up a wonderful friendship. In August 2014, Shirley lost her long hard fought battle with cancer. Her great attitude and sense of humor is sorely missed by all who knew her. Upon her death, Shirley willed me, MJ Stalnaker, her business–meowscape.com/felinedezine.com. It is an honor to continue Shirley’s legacy through her business. I’ve been a graphic designer my entire career, but love to dabble in many different creative venues. Currently I’m sculpting Santa’s, using Fimo clay and experimenting with alcohol inks on tiles and decorating gourds. Like Shirley, I’m a cat lover. I can’t think of a time when I didn’t own a cat and now have three. Two are mine and one is my daughter’s plus her dog. It’s a full house of furry friends. I will continue to strive to offer you the same customer service and quality of product that Shirley gave you. I look forward to working with you. I’ve some mighty big shoes to fill.